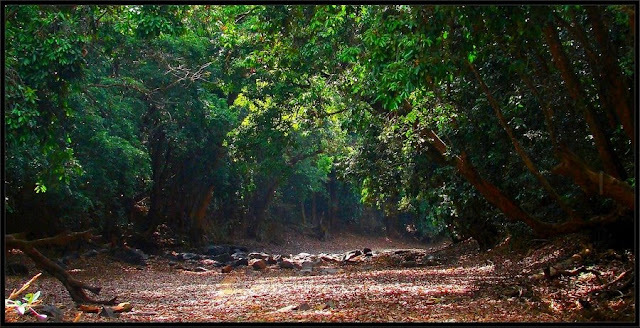 Dandeli-Anshi Tiger reserve is an 874 sq. km area of a variety of habitats, situated in Uttara Kannada, the northernmost district of Karnataka. 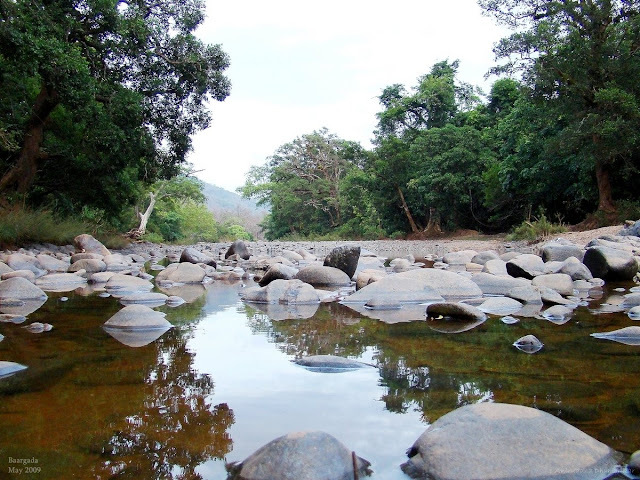 Karnataka has four tiger reserves including Dandeli-Anshi. This tiger reserve is a merged area of Dandeli Wildlife Sanctuary and Anshi National Park, along with adjoining forestlands (10th May 2007). The habitat ranges from moist-deciduous and semi-evergreen to rainforests, with the panorama changing from mountain to mountain. The climate is humid and pleasant with off-season showers quite often besides with hot, sunny days. The flora is diverse, and harbors a myriad of life forms, from insects to large mammals. Everything in these forests is huge in proportion to everything that is seen in my backyard, like huge spiders, huge skinks, huge snakes (and longer) and huge trees, least I forget, ants and etc. I followed all of these, (pardon me botanists!) from mammals and birds to insects and came home with photographs of all I could capture. This is just documentation on papers and on camera of whatever I could see. Some remain unidentified, but most are named. I stayed at the reserve for a week, under Center for Wildlife Studies (CWS) and volunteered to identify, record and map the ungulate population in an attempt to estimate the prey population for tigers. The training was very interesting and exciting, although a little tiring, but the stay in the rainforests carried away all the anxiety, thanks to the rare cold breezes. How-much-ever we enjoyed, the grim truth was clear to us and it was sad indeed. With all of us walking transects daily, we came to know how poor these forests were. There were very few ungulates to be seen, which give a clear-cut picture of the prey population for the tigers. This reality can be known to all of those who have spent their time in the reserve – outside the lodges and camps – into the jungles, looking for mammals day and night. I went Dandeli WLS the third time, with hopes to see a large cat, but failed again. Why cats, even the Chital were seen rarely. But refrain not! The bird and insect (let me tell you, butterflies even – if you don’t like other six legged creeps) life is amazing. You wont go back home sobbing, but satisfied and well aware that we ought to protect this environment, if we don’t wish that the birds go away too. One of the aims of the Department state, “To facilitate ecological, economic, social and cultural development in the tiger reserve and adjoining landscape”, putting in contrasting yet important factors together to conserve tiger is genius but very difficult. I don’t agree with “social development in tiger reserve” if they are referring to the prime tiger habitat also. However, did you know that the Project Tiger is (actually, was) not just about tigers, but it was also a symbol, standing up for every living thing in the forests? By facilitating social (cultural not included) development, we are hampering the habitat. I came across bamboo cutting in pristine forests, burnt bamboo in some areas, unnatural and senseless exotic tree plantations deep inside forests, and clearing of forestlands for curious reasons (is this the economic development they were talking about?). I will put all these in facilitating anti-ecological, economic and social development. 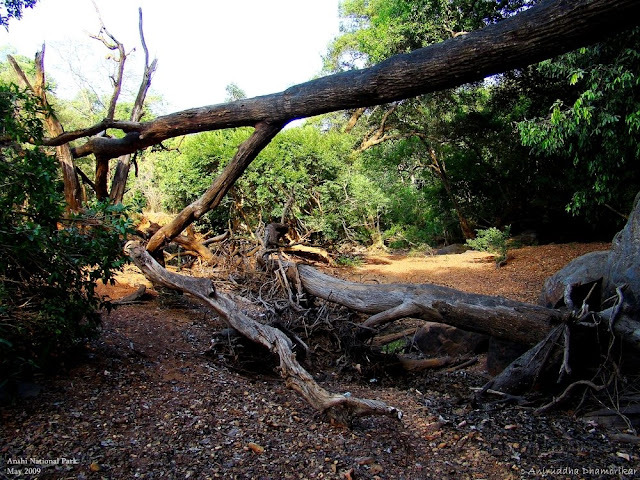 This is also one of the problems being looked into by the Forest Department now, which is a good thing, but signs of destructions are still everywhere. We met the Assistant Conservator of Forest (ACF) at Anshi Nature Camp. He arrived in a cool gypsy and his perfume flared our nostrils – it smelled toxic in the middle of a forest. We hushed on that grand entry into the camp, what in the world is that? After vanishing, he returned and surprisingly greeted us. He knew who we were and what we were doing. We introduced ourselves to him, and had a little chat, during which he told what all he has done as a responsible ACF. He visits villages all around the reserve, spreading the message of conservation. From other sources it was known that he is a very good man, and has been through the reserve, knows its status as well as is kind and liked by the villagers. He appreciated our effort and wished us luck. The conversation ended there in silence and he returned to his tent. Dandeli-Anshi Tiger Reserve has roughly six to eight tigers living in her arms (they say 11), the number that is not viable to survive and increase. From now on, it will come down, down to none unless extreme measures are not taken. I’m not sure what the future holds, but I do hope for the best of this place. It is unique and only place in India that has had a good number of Black Panther (a melanistic form of the Leopard) sightings; the leopard number seems to be healthy too. Besides Tigers, this reserve has also seen dwindling wild Asiatic elephant sightings which are again of much concern. Besides these, the Gaur population that had crashed to a minimum due to Foot-and-mouth outbreak in the wild population is now growing. These are a few such examples that signify that it is a healthy habitat and can hold a huge number of tiger and tiger prey population. Besides large cats, the Tiger Reserve holds a decent number of Sloth Bears, Civets, Porcupines, Mouse Deer, lesser cats as well as plenty of Langoors, Macaques and Giant Squirrels and not to forget Chital, Muntjac and Sambar (although sighting them is an achievement). The other rare mammals would be Slender Loris, Indian Pangolin and the Flying Squirrel. If it can sustain such a variety of mammals, the birds are even ahead of them! There are about 272 bird species (Not confirmed) recorded in the tiger reserve including 19 endemic birds of India. This is again a concerning number if compared to Sanjay Gandhi National Park, which has recorded 251 species of birds on 104 sq. km area of land. 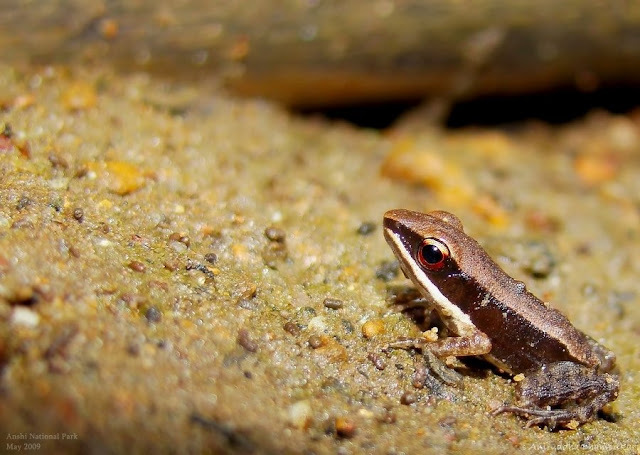 However, many rainforests of this reserve are yet untouched and hide a good variety of fauna, which is evident from recent discoveries of some unknown amphibian and reptilian species in Western Ghats. I did a wee bit of birding and saw the birds which were on my wish-list. 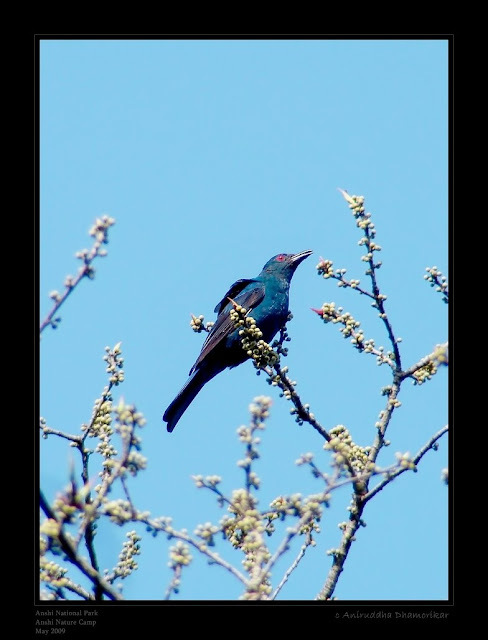 Dandeli is a place to be if you will to watch birds as well as photograph them. Birds such as Malabar Pied and Gray Hornbills, Malabar Trogon, Asian Paradise Flycatcher, Minivets and Black Eagle are bound to be seen. Some rare (or difficult to spot) variety will include Ceylon Frogmouth, Great Pied Hornbill and Owls. The Tiger Reserve holds a good number of butterfly populations along with other insects. This diversity is astounding compared to the vertebrates. It is these insects one should look out for, if you are interested in them. Along with Southern Birdwing – the largest butterfly of India, one can not miss the Malabar Banded Peacock and Malabar Tree Nymph – both endemic to India. There are other giant varieties of beetles such as Jewel Beetles, although common else where; it’s a treat to watch them. Besides these, the ants, wasps and other predatory insects scour the undergrowth for prey and are a constant reminder that this is wilderness. I learnt a good lesson there, someone had said, “remember, a snake might bite you and a leopard might take you”, but it’s the wasps, bees and ants you ought to look out for too as they are capable of stinging you badly! The biomass of insects is more compared to the vertebrates in this region. There are predators, scavengers as well as decomposers innumerable to be missed, but a lot of work needs to be done to identify as well as study them even today. I made a check list of everything that I could see and capture through lens (and tried to identify), the number is however very less, if we consider the potential of this place. Let’s go back to that saying, “a snake might bite you…”, and indeed you must watch out for them! They are superbly camouflaged, waiting in the bushes and leaf litter, waiting for you to pass by them, and you step on them, now they’ve had you, you are dead! But really, snakes don’t want to waste their venom on you. They prefer locations where their prey is abundant – such as lizards, geckos, skinks, frogs and birds too. It is our luck to see them in the wild, admire them and let them be. 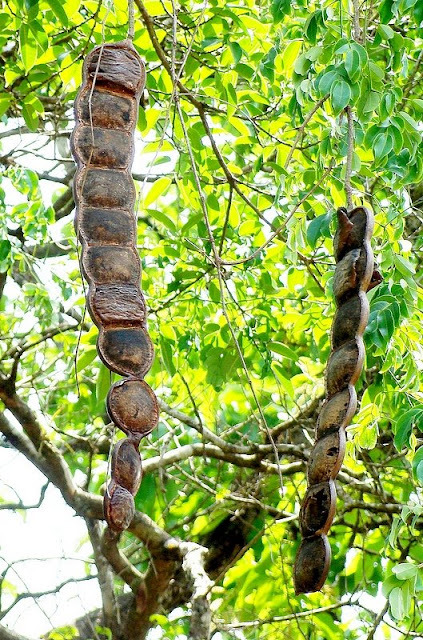 Snakes such as Vine Snake, Malabar Pit Viper and Hump Nosed Pit Viper are fairly seen, other than these, Indian Cobra, Krait, Kukris and also Trinket Snake are seen in this reserve. While I was there, we read a report of King Cobra captured at Joida that measured about 14 feet! It was released into the forests. This was when we passed Joida a day after the news! I was also fascinated by the frog population there. Frogs are seen in all three seasons, and there are records of caecilians during wet season. Malabar Tree Frog, Common Tree Frog, Fungoid Frog, Bronzed Frog, and other frogs etc. are seen or heard during all the seasons; monsoon specifically brings out a treat to the frog enthusiasts. It was interesting to watch so many skinks in the reserve where they would scour the forest floor, keeping one eye on me as they busied about their daily chores. Forest Calotes, Garden Lizard and geckos are very common. One lizard you might be interested in seeing, the Monitor Lizard is also seen here, although you ought to be very keen on spotting one. Other than these fascinating creatures of the wild, lest I forget, there are many leeches and ticks in these forests, and it is their ideal place to be. Rainforests harbor many parasitic creatures that include Bottle Flies (not of much concern to humans) and Horse Flies (Leech and Ticks too) and they are kind enough to bid you goodbye with souvenirs (bite marks, actually) on you – that don’t last long! Albeit this biodiversity, man has an upper hand over these forests and the development is taking a rapid pace, one such case study reveals much of it (of ecologic, of developmental and of cruel intentions) with the “making of the Dandeli dam”. There are many dams in Uttara Kannada of which Supa Dam on Kalinadi is famous, another dam the Upper Kaneri Dam is built across Kaneri River, there are several other dams built on the tributaries of Kalinadi (in all six dams). All these have made Uttara Kannada a powerhouse of energy, all from the natural resources, at the cost of natural resources available. One famous and hard hitting case was that of the Dandeli Dam, that was termed as “worst case of fraud in environmental decision making history in India”. A copy of this is available on the internet here http://144.16.65.194/hpg/envis/doc1999ahtml/miscteri201211.html (and same content here: http://www.esgindia.org/campaigns/dandeli/press/DandeliPR3.htm ) which contains details of this dishonest EIA report at the cost of the biodiversity that has sustained this region for a long time. In short, Ernst and Young, an international consulting firm submitted an EIA report for the Hydal Project that was plagiarized. The firm, as stated in a Press Release dated 5th December 2000, had copied the rapid EIA of the Tattihalla Agumentation Scheme prepared by Institute for Catchment Studies and Environmental Management, Bangalore, by presenting Dandeli as being in Tattihalla. After that followed “tight-lipped” silence, and later another EIA was demanded by the government. As of 2006, the clearance for Dandeli Dam had been stalled. This grim reality is everywhere around us, if you consider a pristine forest of Karnataka or the lungs of Mumbai, the SEZ region in Uran (May 2009). Although these two cases are worlds apart, they do hold a biodiversity that is at stake for human desires. Forest is an ecological niche, defined by the type of vegetation that grows there. Depending on the type of plants and trees, the forests are classified as deciduous, evergreen or rain forests (in this Tiger Reserve). While I walked the forest, I realized that this forest type changes with every mountain you cross, something you can feel as you walk, and breathe – if you even close your eyes. The forest has dense undergrowth as well as a high, thick canopy, on another slope it was ruled by bamboo – young as well as dead, creaking and squeaking as they waved to the air currents. On another mountain side, it was completely covered by cane (Calamus rotang) which prefers growing in dense rainforests – walking amidst them is as good as walking amidst barbwires. While on some patches, there were dried, deciduous patches that were hot and humid and on some hilltops, it was completely open – and you could see the Western Ghats spanning from one corner of the eye to the other. It was vast and stunningly beautiful. I did my best to explore as much as possible from the reserve, and came home exhausted and excited. Yet this beauty was scarred at some places, thanks to the extensive “plantation” projects by the government. We came across wide patches of Teak, Australian Acacia and Cashew nut trees, all in the middle of a natural forest. This logic of afforestation ought to be changed, and it was realized by the Forest Department in time, now they know what Australian Acacia is and what’s natural to belong to these forests. Albeit pressures from humans, the Dandeli-Anshi Tiger Reserve still stands strong, and attracts a lot of tourists. Eco-tourism is taking good shape in these parts, along with other environmental projects to protect it from further harm. On my stay, I had a few revelations I discussed above, but I was glad there are some of us who really care. I sighted 52 species of birds on my stay, 64 species of insects including 28 species of Butterflies, 12 species of Dragonflies, 2 species of Damselflies, 6 species of ants and other insects that could not be classified up to species level, such as grasshoppers, flies, hemipterans, beetles and arachnids. I sighted 9 species of reptiles – including snakes, geckos and lizards, few frogs and ultimately 11 species of mammals. All the species were either identified on the field or through photographs. No specimens were captured or collected. The sightings were recorded at Dandeli Wildlife Sanctuary, Anshi National Park, Kumbharwada and Baargada, all a part of the Dandeli-Anshi Tiger Reserve. The habitats ranged from forestlands (semi-deciduous, semi-evergreen and rainforests), to rivers and streams that were mostly dry or contained stagnant pools. 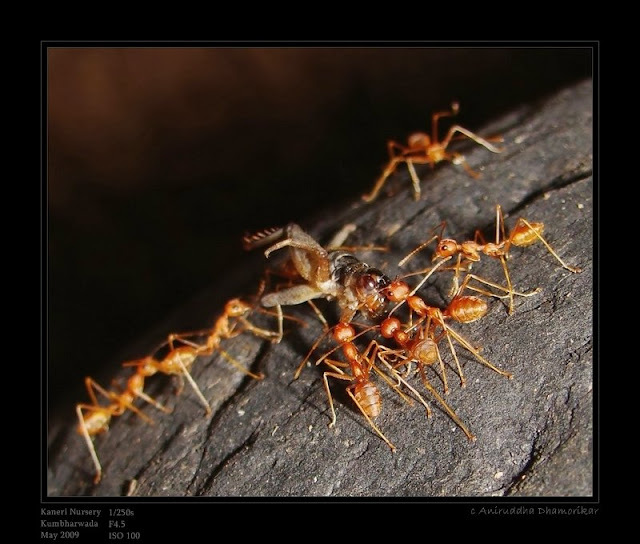 Procession Ants - Leptogenys processionalis: These ants are so called because of their habit of walking in a procession. These were common throughout the reserve, in all sorts of habitats. They were active during day as well as night hours. 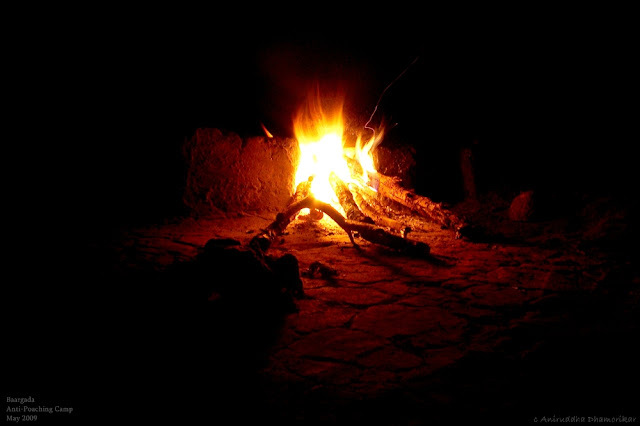 This photograph was taken at Kulgi Nature Camp in Dandeli WLS. 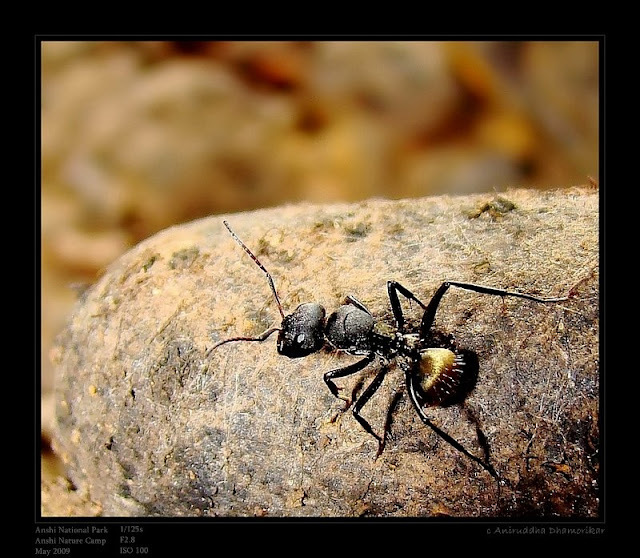 Common Golden Ant – Camponotus sericeus : These ants are so called because of the golden hair on the gaster. These were also common throughout the reserve. These ants show a variety of morphs, where the golden color is either absent or present at a greater extent. The ant, if disturbed, has a tendency to freeze for a moment, and then run rapidly for cover. Weaver ants – Oecophylla smaragdina: A common ant of the reserve, known to weave leaves together to form housing for the colony. 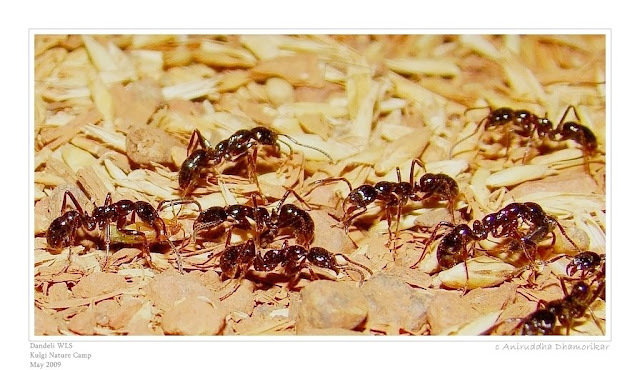 These ants were seen in all sorts of habitats including dry riverbeds, much away from any plant. 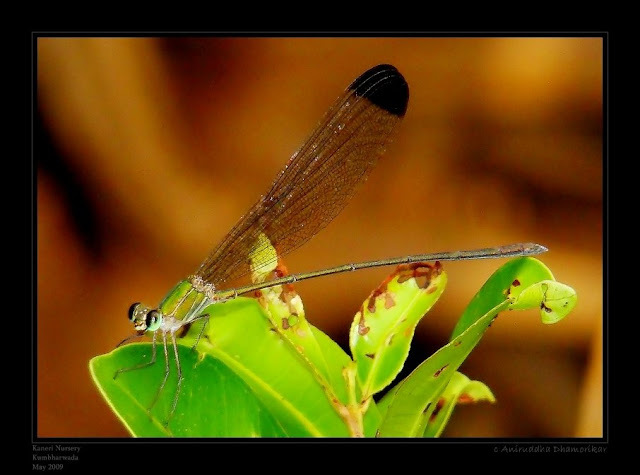 Black-winged Bamboo Tail – Disparoneura quadrimaculata: A medium sized damselfly, seen at Kaneri Nursery. It was the only damselfly amidst a swarm of dragonflies at the pond. 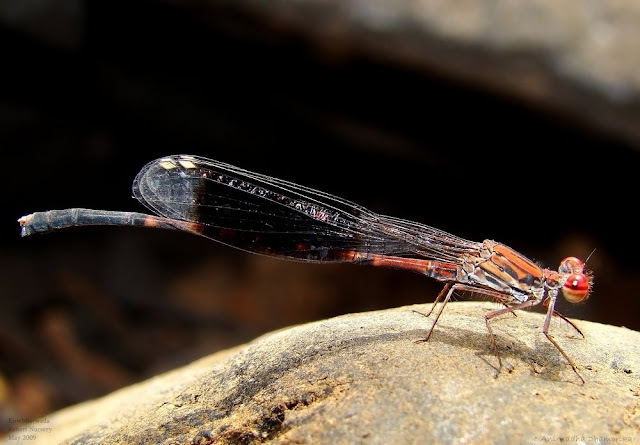 The damselfly perches on emergent boulders and prefers flying low on the ground. 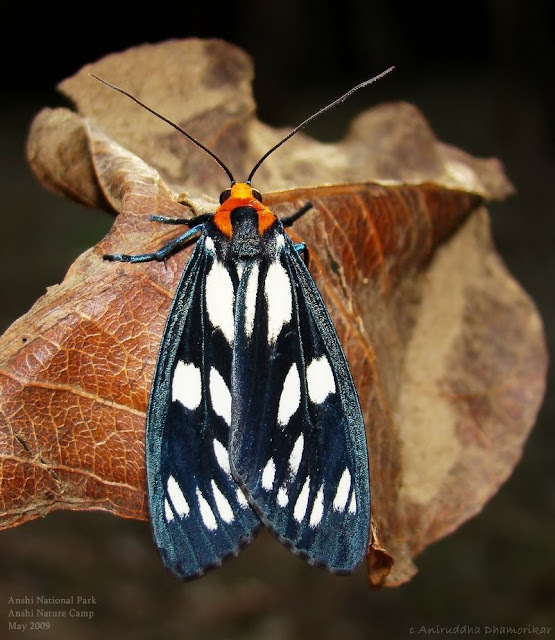 Black-tipped Forest Glory – Vestalis apicalis: A large flutterer of the rainforests. Prefers thickly covered patches, always seen near a stream. This damselfly was seen in abundance at some pockets of the forest. 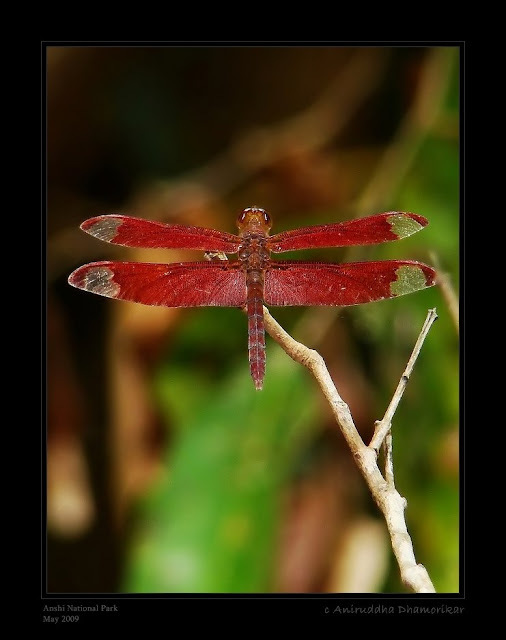 Fulvous Forest Skimmer – Neurothemis fulvia: A conspicuous dragonfly preferring wet forest habitat. It was seen near a stream at Anshi National Park. 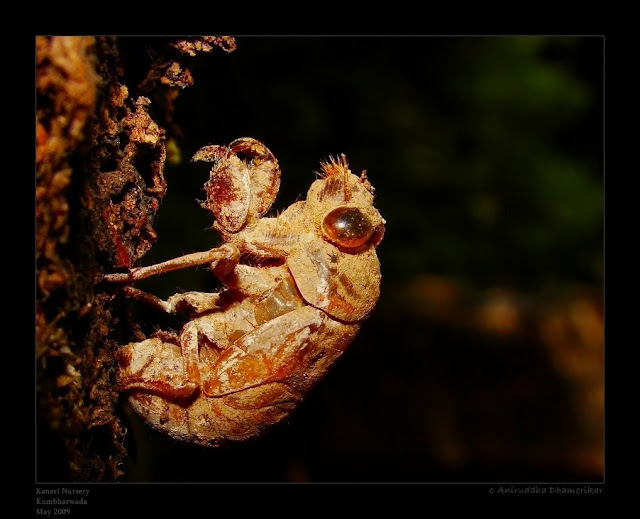 Cicada – Moult: Cicadas are very common throughout the reserve. The calls are shrill and can be heard at a great distance. They are amongst long living insects in the world, the nymphs (as seen in the picture) living for several years underground, feed on plant root sap. The adults emerge in mass numbers, and their only purpose is to mate. 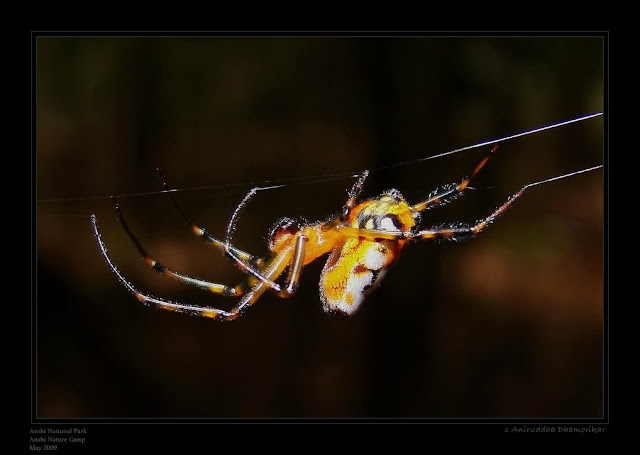 Orb Weaver – Leucauge sp. 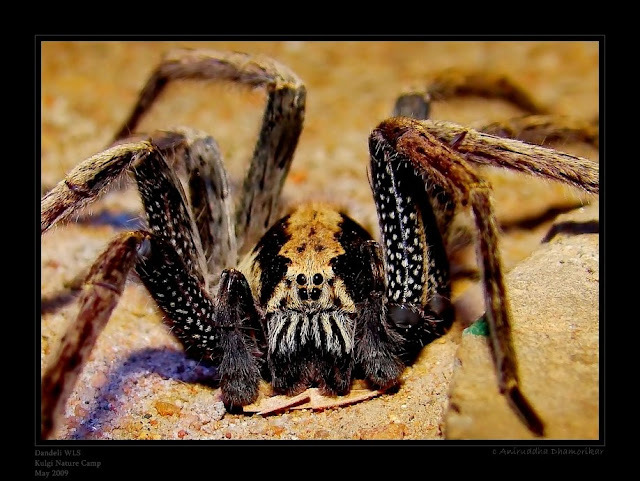 : A brightly colored Orb-weaver seen commonly through the reserve. 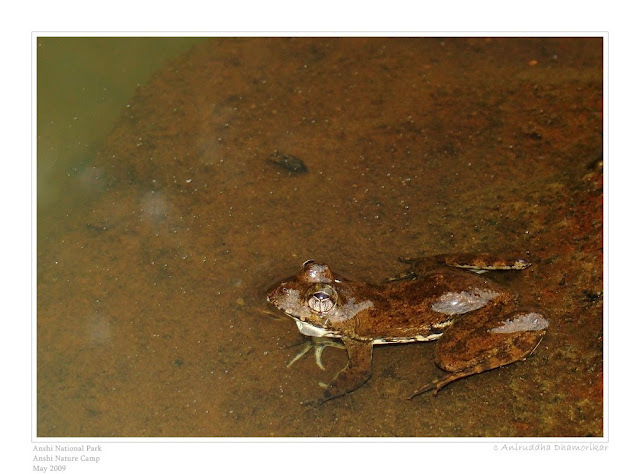 Bronze Frog – Hylarana temporalis: An endemic frog found in riparian ecosystems of the rainforests of the Western Ghats. The sightings were at moist streambeds as well as stagnant pools. A large number of small adults resided in the leaf litter, under stones and fallen boughs in wet patches. Skittering Frog: I am unsure of its identification. 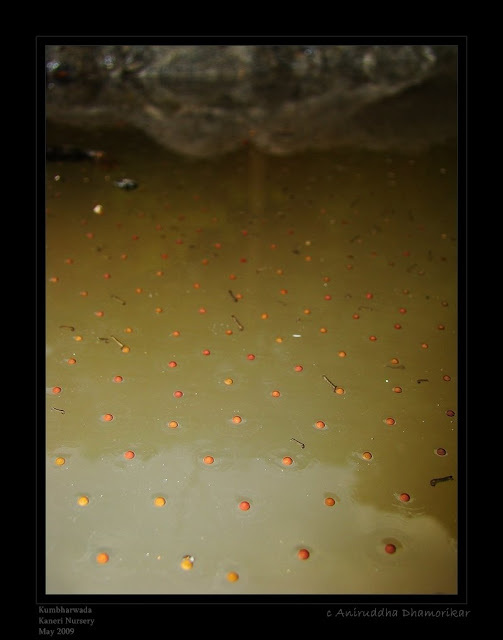 Countless frog eggs were seen at pools in Kaneri River at Kaneri Nursery. In this photograph, many mosquito larvae are also seen besides the eggs. 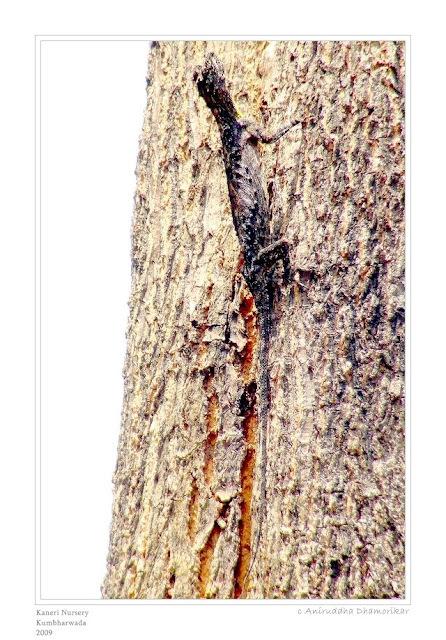 Forest Calotes – Calotes rouxi: A common lizard of the reserve. Males show bright red color on proximal sides, generally to attract female or to warn other males of its presence. Post-monsoon days are the breeding season of Forest Calotes, where males as well as females usually seen in close proximity. 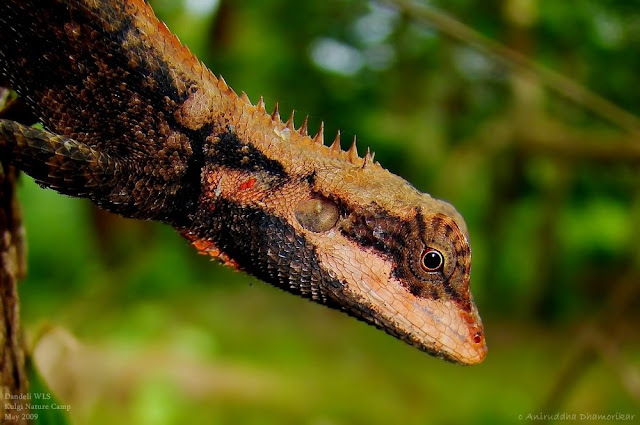 The Southern Flying Lizard – Draco dussumieri: A lizard that is capable of gliding through the high canopy, Draco is very common in the reserve. It is an endemic lizard, males often seen flashing its brightly colored yellow gular sac. The “wings” to assist in gliding are actually modified ribs that can be stretched out. They are covered by skin and scales. 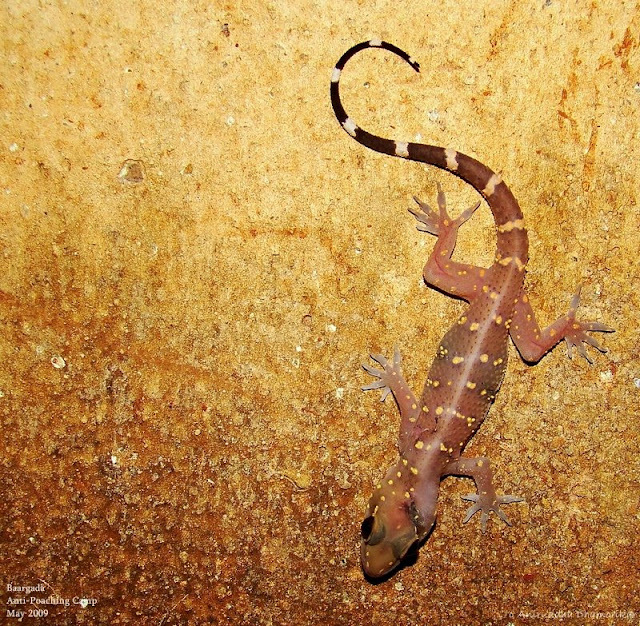 Bombay Leaf-toed Gecko – Hemidactylus prashadi: It is found in Western Ghats only. This one was seen in Baargada (Anshi Range) at the Anti-poaching Camp. 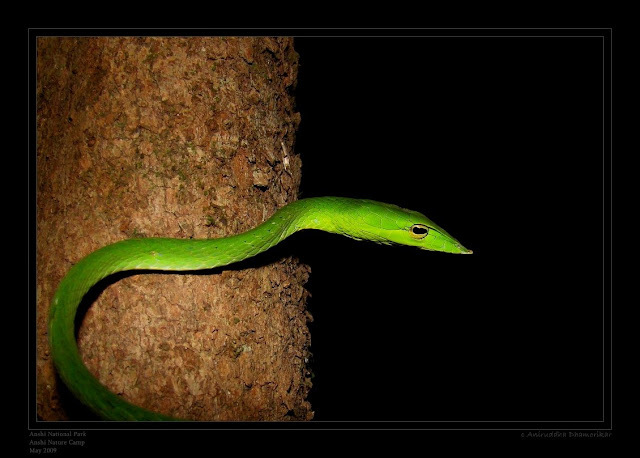 Long-nosed Vine Snake – Ahaetulla nasuta: A beautiful arboreal snake, preying on lizards, geckos and sometimes even birds, is commonly seen at the reserve. It is one of the commonest snakes to die under the vehicles on the roads. 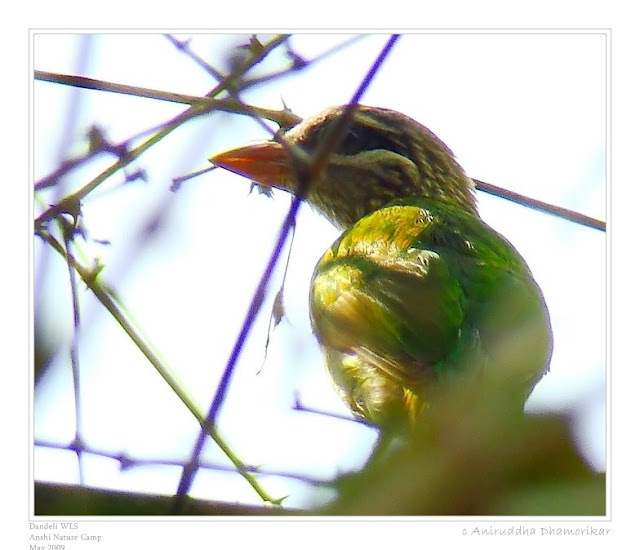 White cheeked Barbet – Megalaima viridis: An endemic of the Western Ghats, also commonly called Small Green Barbet. The calls of this bird can be heard throughout the forests, more common during monsoon season. 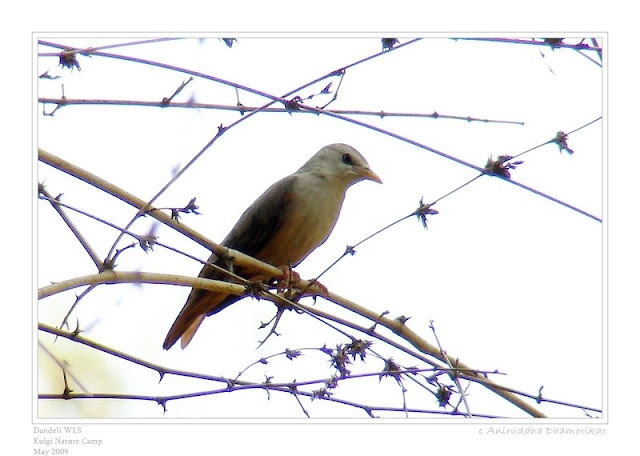 Chestnut-tailed Starling – Sturnia malabarica blythii: Also called Grey Headed Myna, they are seen in flocks, and are omnivorous. This individual is from a flock of 9 others seen at Kulgi Nature Camp. Malabar Whistling Thrush – Myophonus horsfieldii: It has a lovely human-like whistling tune, commonly heard in the reserve at dawn. They prefer dense forests and can be sighted at riverbanks. 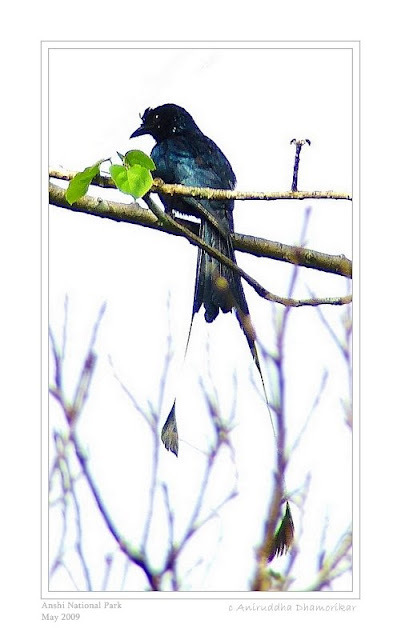 Racquet Tailed Drongo – Dicrurus remifer: A beautiful bird common at the reserve, capable of mimicking calls of other birds. It is larger than a Black Drongo, prefers staying high up in the canopy. 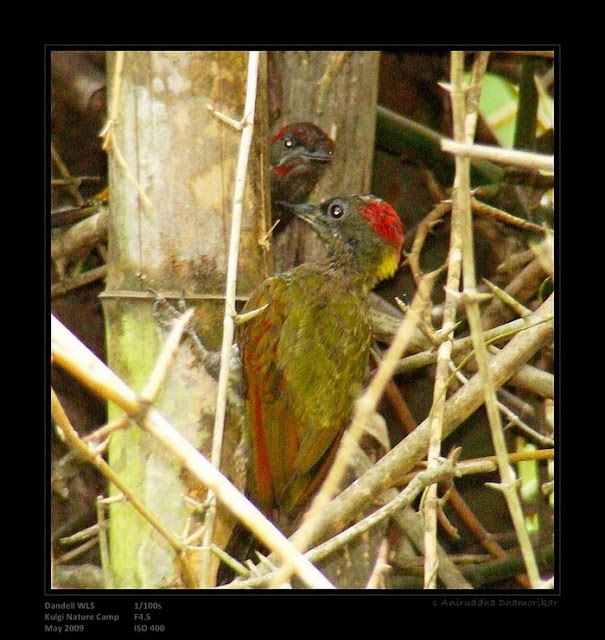 Lesser Yellownape – Picus chloropsus: A common woodpecker of India, the peninsular subspecies of which shows a grey, duller head. A pair of these was seen at Dandeli Wildlife Sanctuary pecking bamboo. 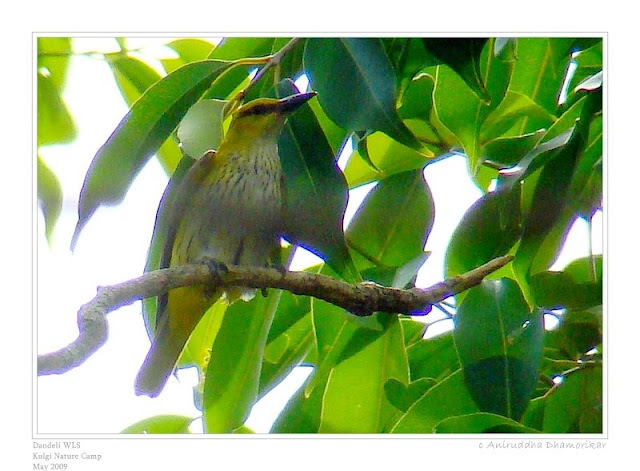 Black-naped Oriole – Oriolus chinensis: Juvenile. Gray Langur – Semnopithecus sp. 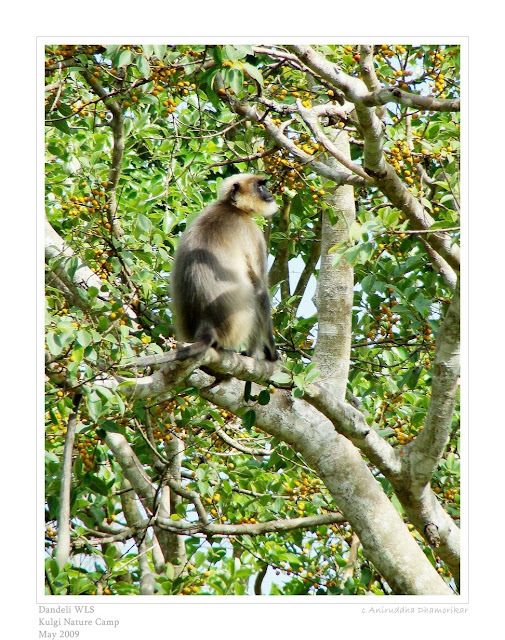 : There are seven species of Langurs in India. These are the most common mammals at the reserve. They are seen near human settlement as well as in isolated pockets of forests – in all kinds of habitats. I spent a week at Dandeli-Anshi Tiger Reserve and learnt a lot about field studies, identification keys and different habitats. What amazes me most is how different all these habitats are, yet so delicately woven that if one habitat is disturbed, the whole artwork of nature is shaken. It took countless years of evolution, a natural way of the development that is put to so much of stress due to human development. The customs and culture of the people that belong to these regions (the tribal) have learnt to adapt to the life there. It is the external forces that are not-so-adapted to these landscapes who want to change it for the betterment of them. This Tiger Reserve is one of the many in need of support from everyone – from stockbrokers to wildlife enthusiasts, from a layman to an expert. It is a place so unique to our country that if we manipulate it, we play with our own lives instead. A little effort, like carrying absolutely no plastic to the reserves can make a big impact and even if you do, make sure you take it home with you – that is the best place to dispose plastics because we don’t know where it goes from there! Jokes apart, it at least stays in the garbage dumps rather than littering the forest floor. Last but not the least, it is not the “jeep safaris” but the natural trails on which one walks – that brings out all the excitement (and raw fear) of seeing a bear, or a leopard – or even a tiger – (AND birds and butterflies!) loitering in their home. I am not against jeep safaris, but I hate traffic in the reserve waiting to see a tiger yawn in the middle of a road. The post is really amazing and an eye opener! Being a localite i haven't have gained the knowledge about the forest as you have mentioned and applaud for the great contribution. I would like to get more inputs from you to make the place a better one and educate the localites about the advantages of the nature! That was a great article! Me and my family visited Anshi last year, but we didn't see much even though it was just after the monsoons. thanks for sharing nice & very useful information & photographs.this will guide me while visiting dandeli. This work is licensed under a Creative Commons Attribution-NonCommercial-NoDerivs 3.0 License. Contact me if you need to use any of my works. A Field Guide to Insects and Spiders of Kanha Tiger Reserve (India) is out! Click the image for more information.